Is State Street, you can buy there everything you want from clothes to food. I walk everyday across the State Street, but if you want to walk the hole street, you have to be sporty because its a long street. There is a little Passage called Paseo Nuevo, where are cute stores and many little restaurants. But State Street is a expensive street, if you want to safe money, you should probaply go to another one. I think the street is the most popular thing in Santa Barbara, because you can meet people and do a lot. Is Butterfly beach. He is a bit farer away than West Beach, but i think it is worth it. The water is very clearly and there is more sober sand. You have more space because there are not many people. I was there for two times and i loved it. In the wate you can see some small fishes, they are very cute. 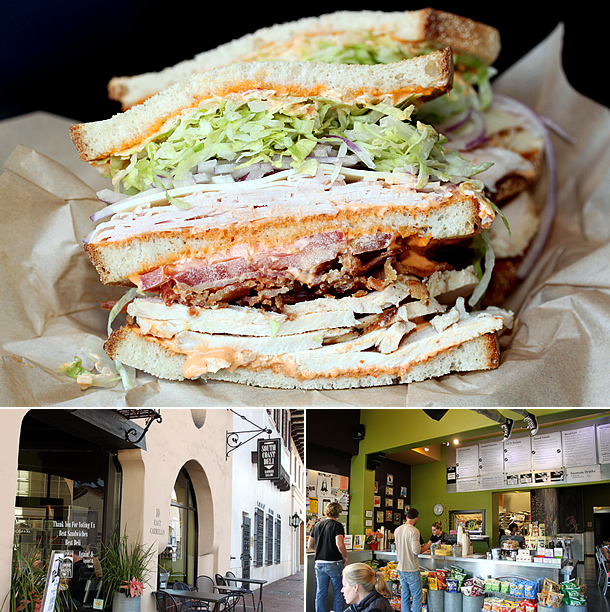 The best food is across the street from our EF school and called South Coast Deli. They serve sandwiches, paninis and many salads. All food is fresh and every student from EF is going there. I think because of the cheap prices and big sizes from the meals. So you dont have to be hungry anymore.